You might not be a Keyboard Ninja, but would like to be able to navigate through Windows with the mouse more quickly. 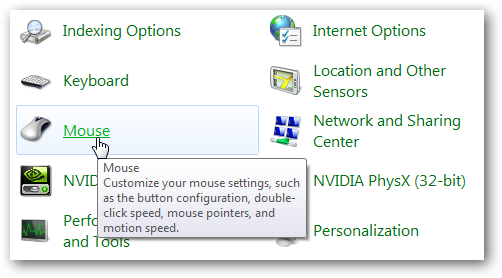 You can make mouse navigation faster by increasing the pointer speed and using the “Snap To” option available in XP, Vista, and Windows 7. To activate these features click on Start then Control Panel and click on the Mouse icon. 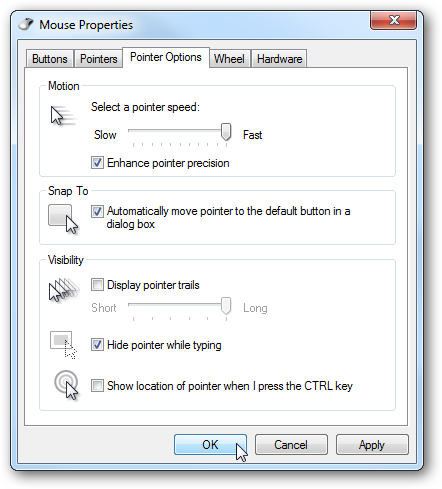 In the Mouse Properties window click on the Pointer Options tab. Now increase the pointer speed and check the box next to Enhance pointer precision…this seems to come in really handy with touch pads on laptops. Under “Snap To” check the box next to Automatically move pointer to the default button in a dialog box. Just keep in mind that with these settings the pointer will move faster on the screen, and will go directly to the default button in a dialog box. If you’re click happy, you might end up clicking “Yes” instead of “No” in some situations. It takes a bit of getting used to, but once you do, you’ll be flying through Windows a lot faster. This is one of the first things I setup when using a new computer.